This time of year we get many questions regarding the correlation between egg allergies and flu shots. These questions can come from patients, parents, teachers, and even school nurses. 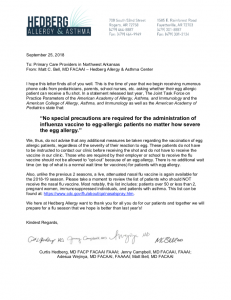 Below is a letter written from our very own Dr. Bell to educate you on the correlation between an egg allergy and flu vaccinations.